The most famous Cafes, Bars and Clubs are located around the lake of Aghios Nikolaos, in the city center and along the coastal road in front of the port. There, one can be entertained by listening to music and dancing until the morning. 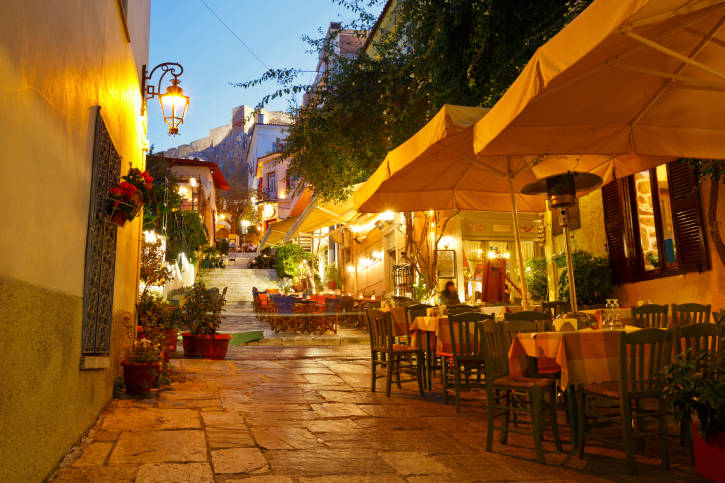 In Kitroplateia square one can find a variety of taverns to drink ouzo and eat “mezedes”. parties to traditional evenings with Cretan music and dances. Summer in Crete and Greece means “tables outside”: The guests meet the local people and everyone joins the party. After the sunset, people start gathering in “ouzo shops” and “taverns” (which are usually next to the sea or have a view to the sea) to enjoy “tsikoudia” (traditional local drink) or ouzo and special snacks. The night continues in various music halls, discos, clubs, bars, “bouzouki” or “Cretan Lira” places (halls with live Greek or Cretan music) in the beautiful narrow streets or at the coastal zone of the island until the morning. For those who want something more relaxed, there are various art festivals and cultural events, like theatre performances, concerts with any kind of music and dance and summer cinemas.